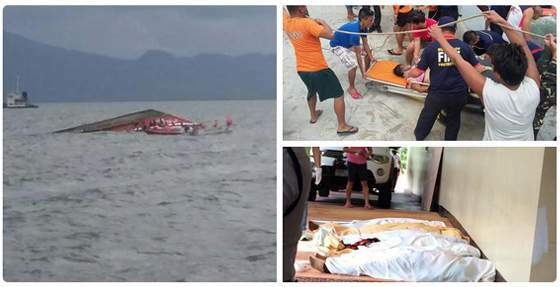 Passenger boat capsizes off Ormoc City, more than 60 people dead (Updates, photos & videos) - Balita Boss! The passenger boat M/B Kim Nirvana-B capsized off the coast of Ormoc Port in Ormoc City, Leyte on Thursday, July 2, 2015. According to Philippine Red Cross (PRC), the wooden passenger boat had been carrying 173 passengers and 16 crew, reported by Marina Region 8. GMA News reported that the death toll in the Ormoc sea mishap rose to 61. The Philippines ferry was heading to Pilar town in Camotes Island east of Cebu when the accident happened. Here are some of the updates, videos and photos posted on social media sites. Usec. @Abi_Valte: PNoy has ordered an investigation on the capsizing of the boat off Ormoc even as the search and rescue is ongoing. JUST IN. A passenger banca capsized near Ormoc City pier. Rescue operations on-going.